Ticket price: £5.00 (Please note that pre-booking is essential, and that the number of tickets is strictly limited to 30 for each session.) Light refreshments will be available. Parking: Please arrive promptly to start the viewing at either 11.00am or 2.30pm. There is ample parking at the house. Click HERE to book for the 11.00am viewing (the 2.30pm session has been fully booked). A chance to visit the home of leading Cornish art historian, David Tovey, to see and learn about his remarkable and extensive private collection of Cornish paintings by both British and foreign artists. 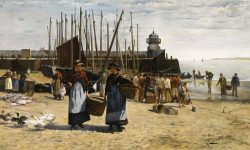 David’s original interest in Cornish art derived from the fact that his great-grandfather, William Titcomb, was one of the first artists to settle in the St Ives art colony in the late 1880s. There is a strong St Ives bias to the collection and, as St Ives pre-1914 was considered internationally to be “the Mecca of the seascapist”, there is also an emphasis on marine paintings. After an introductory talk by David, guests will be free to roam the house, with notes on the paintings being provided in every room. This event is linked to David Tovey’s talk on ‘Vagabond Verses – The Poetry of Crosbie Garstin’, on Sunday June 4th.